Carpool Karaoke is his amazing creation and is frequently featured on his show, The Late Late Show with James Corden.. 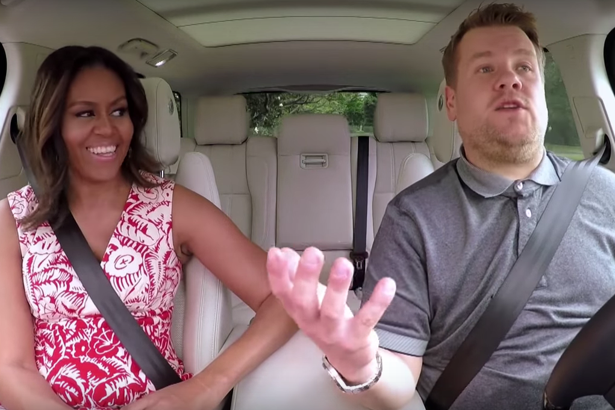 The latest installment spotlights Michelle Obama in the passenger seat. FLOTUS has all the moves down to Beyonce’s, Single Ladies and knows every word to Stevie Wonder’s, Signed, Sealed, Delivered, which was a favorite tune during President Barack Obama’s 2008 campaign. The carpoolers kicked it up a notch for Missy Elliott’s, Get Ur Freak On. They got down to, This Is For My Girls, a song that benefits Michelle Obama’s, Let Girls Learn initiative, and features Missy Elliott, Janelle Monáe and Kelly Rowland. The program aims to help the 62 million girls worldwide who are unable to attend school. The First Lady has a divine sense of humor and she brings to life my fantasy of belting out a song with all the appropriate moves in a car with filled with eager participants. Corden literally drives circles around the First Lady as they repeatedly navigate the circular drive at 1600 Pennsylvania Avenue. Thankfully, no one got car sick. love it! saw a snippet on tv, but you saved me the trouble of finding the link to watch the whole thing. can’t help but smile. i understand there are people who disagree with Obama’s positions on a variety of issues, but how deep is the well of hatred that this first family is not universally embraced? meanwhile, funny sideline — they drove in circles at the white house, never leaving the premises, but were followed the whole time (you can see the “chase” car in the rear view window). I know…I wanted to fit that the Secret Service presence into the post, but it did not resonate. I agree completely. I could never have kept my tongue the way the Obama’s have. They have endured such vile criticism and lies. History will reward his presidency. The lies Trump spews are outrageous. The sad thing is people believe him. Even last night’s acceptance speech was filled with distortions.